[New for 2014, Went full time in 2016] While Nick is running around trying to find all the new Haagen-Dazs gelato flavors, I was wandering through Wal-mart when a bright purple box jumped out at me from the bottom shelf. 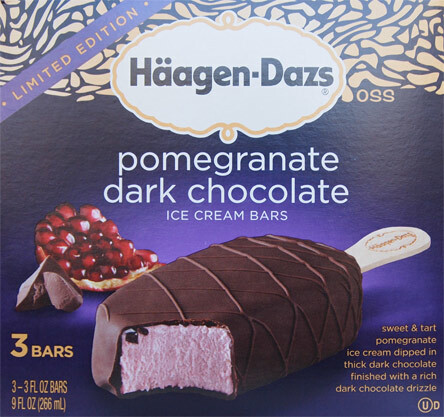 New Haagen-Daz ice cream bar? Yes please! Oh man, I forgot how good the H-D chocolate shell is! oh, just awesome! I love how it starts to melt the second it hits your mouth. 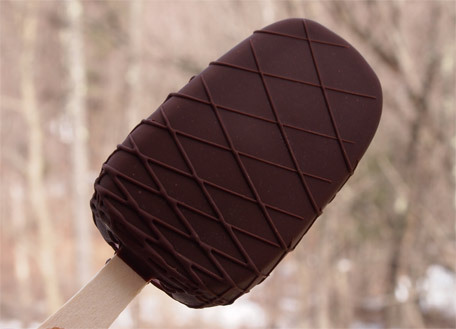 This creates an instant chocolate coating on your tastebuds. Mmmm, so so good. The ice cream inside is solid, just the way you want it to be. It's not rigid or gritty, and it's not too dense, but it's resistive enough to force you to slow down. 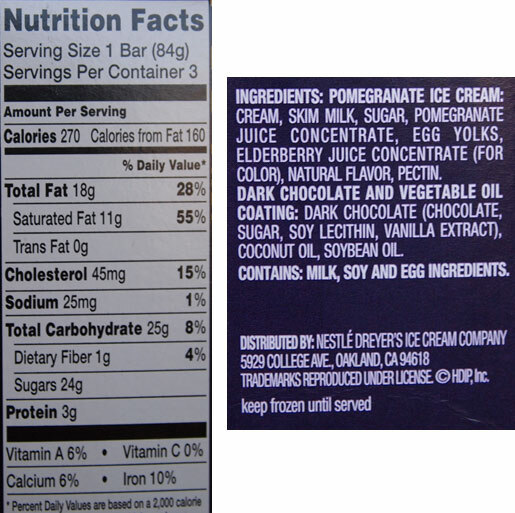 For someone who likes to inhale ice cream bars, I need some heft to the filling inside. Ok, Two for two on this one so far. The flavor is unexpected and my wife was an instant fan. The flavor is outside of the typical choices we see on store shelves and it works great. It's natural, it's crisp, it's engaging and it's not afraid to bite back a little. It's almost like there is some bright pomegranate juice mixing around in there. Actually, I have a better word, and this might sound a little strange, but it's juicy (for lack of a better term). The flavor is just that robust. Wow, I am really impressed with this bar. I'm not really even a fan of pomegranate, but it's just such a powerful flavor inside this delightful chocolate shell that I can't do anything but give it two thumbs up. Awesome job H-D.
That looks incredible! I'm def gonna look out for these bars! Haagen Dazs has stopped making it. I don't understand why something so delicious would only be a limited productioon. COMPLAIN VEHEMENTLY to HD get this on their permanent line. Nowadays, this is how HD tests flavors. I wouldnt complain, I would enthusiastically suggest that they bring it back next year. I hope it's back! Please bring it back! It's the most divine flavor ever - LOVE IT! It's back! And as a regular flavor, not even a special edition. I bought boxes last weekend! Obsessed! 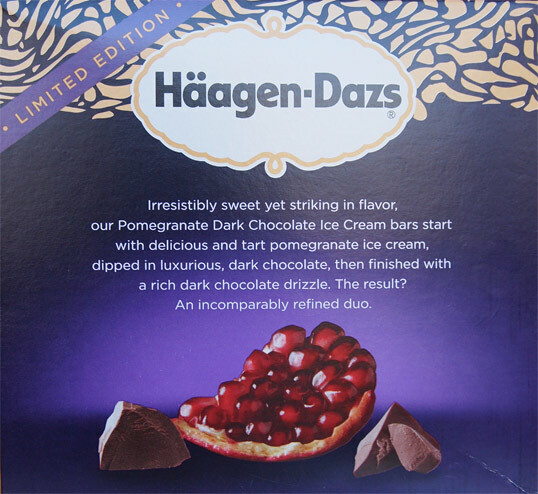 I loved the Pomegranate ice cream, but I believe it is discontinued as I haven't seen it in ages. This bar is absolutely delicious. 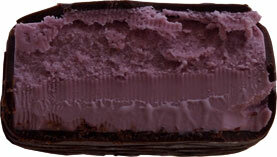 The pomegranate ice cream is tart and it pairs well with dark chocolate. I hope it is true that these are not limited and they will be readily available. please be aware that it's now in the full time gold box instead of the limited edition purple box, I hope you find them soon! I am addicted to these bars.